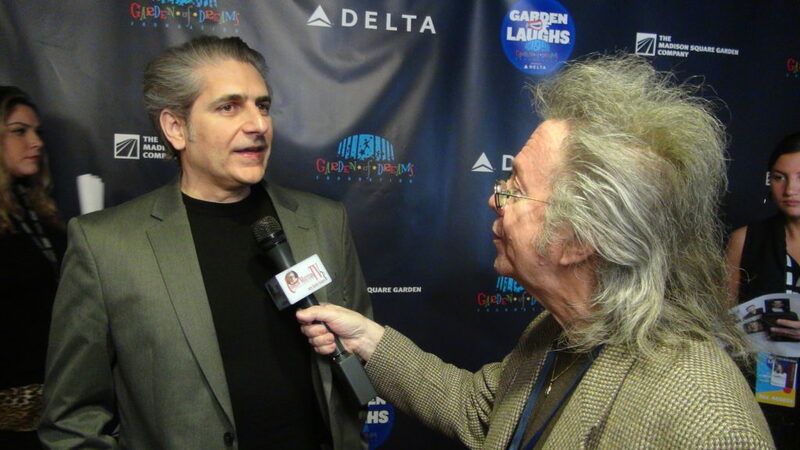 I had been waiting for weeks to cover the biennial “Garden of Laughs” at the Hulu Theatre at Madison Square Garden. It’s a star studded event that raises money for underprivileged kids and kids with disabilities. It’s produced by Rory Rosegarten of The Conversation Company and his team, and features some of the biggest comedy stars in the biz as well as many top actors. We were expecting Jerry Seinfeld, Bill Burr, Jon Stewart, John Mulaney, Michael Che, John Oliver, Iliza Shlesinger, Tiffany Haddish, Brian Regan, and actors Debra Messing, Lucas Hedges, Ansel Elgort, Michael K. Williams, Toby Leonard Moore, Gaten Matarazzo, and all hosted by 3 time host Steve Schirripa of Sopranos fame. A lot of people don’t know that Steve booked some of the biggest comedy acts when he used to book talent in Las Vegas, and he’s very funny in his own right. Not every star decides to do the red carpet so we’re never really sure who’s going to come out. It was slated to start at 6:30, so I made sure to get there at 5:30 to have time to set up because there’s no real schedule with a red carpet. It’s very stressful. Sometimes several stars come out at once and while you’re talking to one, another one you would have liked to talk to walks by. It’s also all improv. Some journalists come with stock questions that they ask each person. Not me! All my stuff is improv’ed on the spot. I specifically had my videographer show up at 4 to pack the camera bag and make 100% sure we had all of our equipment. We went over it together. So imagine my surprise at 6:10 when he suggested that we do a mic check and the shock ran through my body when we realized we hadn’t packed the microphone. I can’t describe the horror, and the icy cold feeling that ran through my body. Weeks of planning, and I’m on the red carpet with no mic. The one thing you need to do interviews besides the camera and we didn’t bring it. I decided I’d have to run home and get it. But I live on the other side of town and it was rush hour. Perfect! I told my assistant to try and shoot some B-roll, and I ran out like a maniac, flashing my red carpet badge to security as I ran through one door after another. As I was running I tried to figure out which would be the fastest way to get home. Should I run back to 8th avenue to take the train, call an Uber, or just jump into a taxi. I chose the closest taxi and just like in the movies I told the guy to step on it. I said I had to get across town and back in 20 minutes which was impossible. I turned on my WAZE and we got to my house at 6:26. I told him to wait in the downtown direction, jumped out of the cab, ran past my doormen, got the mic and ran back downstairs so fast that both of my shoes opened and I didn’t stop to re-tie them. Just past 6:30 my assistant texted me that no one had come out yet. As we got closer to the Garden he texted me that John Mulaney was on the red carpet! Shoot! I was hoping he’d come out late but he came out first. Luckily my videographer had the sense to tell John he was working with me, and that I had to run home to get my mic, so John left me this hilarious message, which made it a little bit better! Of course as we got near the Garden we got stuck in traffic, and every block seemed to take a year. Finally we pulled up in front, I gave the driver a big tip just like in the movies and ran back in, not expecting to have to go through airport-like security again. But I was wrong. Very wrong. I flashed my badge but it did no good. I told the guy I had forgotten my mic and had to run home to get it and I was missing the whole red carpet but he wouldn’t hear of it. He said he had to do his job. The only man in Manhattan who had to do his job. And of course because I was so nervous I kept leaving something metal in one pocket or another and literally had to go through the metal detector about 10 times while the people behind me waited patiently. Finally he let me through and then I first had to re-fill my pockets. 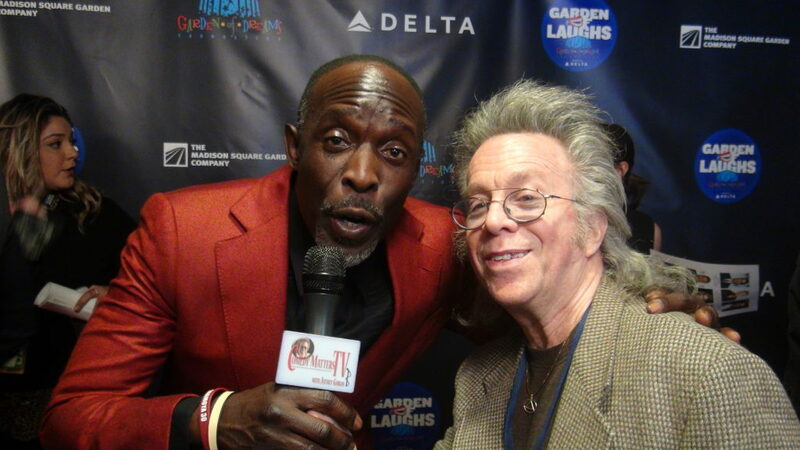 By the time I got upstairs I had missed Mulaney and Tobey Leonard Moore from Billions who I would have loved to talk to, so I finally bent down to re-tie my shoes, and then Michael K. Williams came along. I loved Michael’s characters “Omar” on “The Wire” and “Chalkie” White on Boardwalk Empire so I was excited to talk to him. 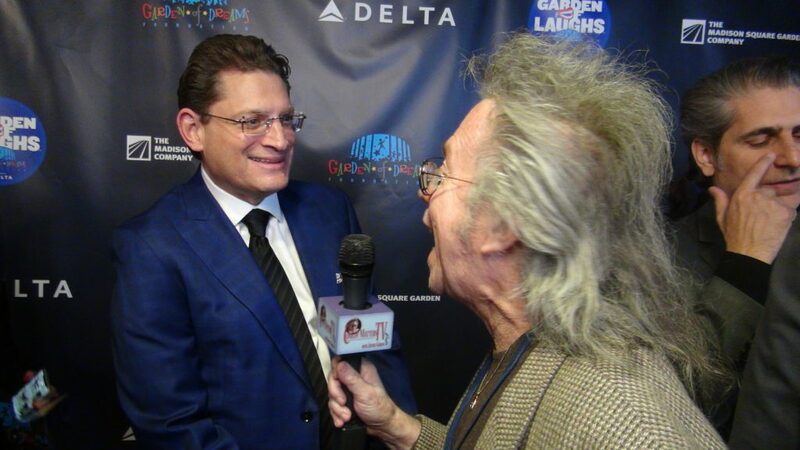 He told me that working with Martin Scorcese was a dream come true for him and that he also works with kids from Garden of Dreams which is the charity itself that Garden of Laughs raises money for. To tell you the truth I had never noticed that he had a scar that ran from his forehead right near his eye and down onto his cheek. Obviously I didn’t bring it up, he did. He said he was working with a young boy of 14 who also has scars on his face from an assault, and that he was able to give him some reassurance that he’d be okay. Michael told me he had been assaulted by a gang on his 25th birthday. Man’s inhumanity to man. Rory Rosegarten came out and told me had been looking for me because he knows I always come early to these things. When I told him the mic story he said the exact same thing that John Mulaney said without having heard him say it. You can hear it for yourself in the video below. He was there with his family. I was able to congratulate him on another successful show, and it was great to see him looking so healthy again. Michael Imperioli who played cousin Christopher Moltisante on The Sopranos came out next, and we hadn’t seen each other in years so it was so nice to re-connect. He’s got a movie coming out with Nick Cage, and an NBC TV series based on the movie The Bone Collector, and when we inquired about each other’s health and I told him I had survived a heart attack he said he was sorry, and it sounded like he said he was sorry I survived. Funny!!! Bill Burr is always a great time on the red carpet and as soon as he sees me he starts yelling out things like “Oh no”, and “This is gonna be good.” I told him I was thinking of texting him to let him know I was going to be there so he could think up some insults for me, but he said he didn’t need any advance notice because they just came naturally. He started out by asking me about my sport jacket and if I had gotten it at Woodstock, which was actually very funny. 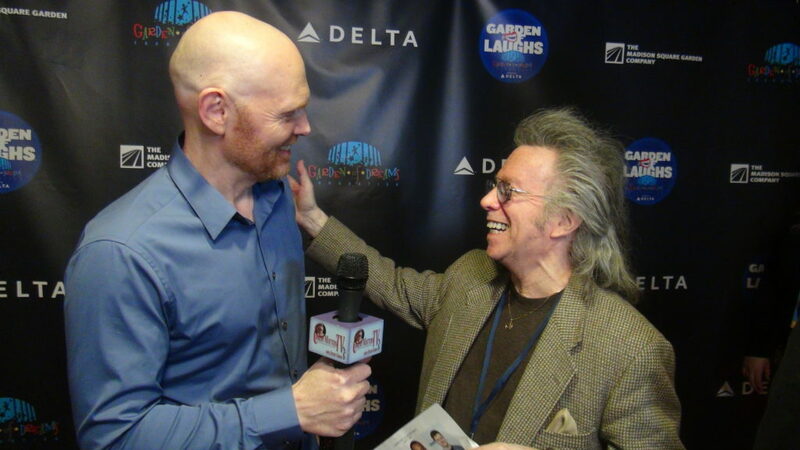 I asked him if he knew of the You Tube video called “Bill Burr Roasting People” which has over 5.4 million views and opens with he and I on the red carpet where he says he hopes I go bald so that one day we’re two old bald guys on the red carpet.” He said that not only does he know about it he hates that people think he doesn’t like me because he LOVES me, … and that made me feel really good. I had sent him a recording that the late great Patrice O’Neal had left for me on my phone one night at 4:05 A.M. It was the first night we had done the Black Phillip Show together and Patrice was so happy with it he couldn’t wait to call me and so humbly suggested that we do a show together just the two of us. He said he didn’t want to assume anything, as if I might have said “No”, but unfortunately we never got to do it. I still get messages and e-mails from guys who track me down to give me props on my work on Black Phillip. R.I.P Patrice. Btw Bill said he listened to it, and I hope he did cause it’s one of my greatest possessions, along with the phone message that Richard Lewis left me saying that some jokes I had written for him were “hilarious” and if he was ever going to use anyone else’s jokes it would be mine! Bill’s interview went on so long that at one point he asked me if it was still an interview or just two guys talking on the corner! Then he offered me a $700. class he was giving on how to end an interview. He’s hilarious and the very best! And he’s off on a tour from Iceland to Israel! Last on the red carpet was John Oliver who was going to be the very first presenter that night. I asked him if his kids were old enough to know that he’s playing Zazu the bird in the new remake of The Lion King directed by John Favreau due out this July. He said his son is only three and he took him to a movie in which he did the voice of a porcupine named Steve. He told him that was his Dad and his son said ” No it isn’t”, just like my Too Much Tuna sketch with Nick Kroll and John Mulaney. Anyway this little video is a recap of my adventurous day on the red carpet of Garden of Laughs. 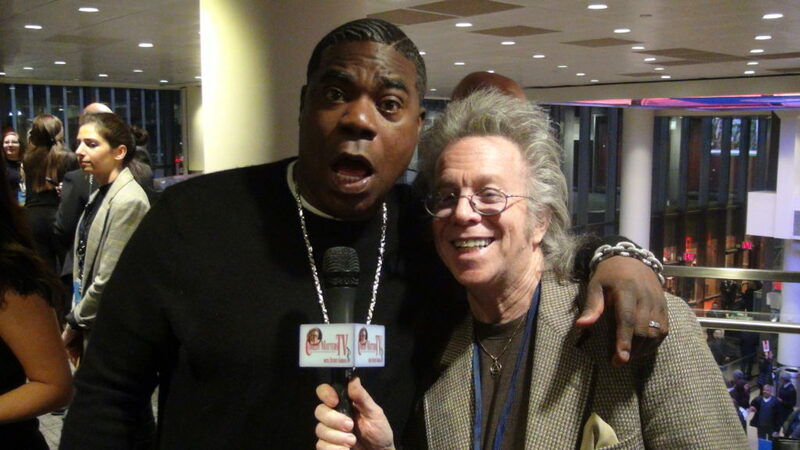 Jeffrey Gurian is the host of Comedy Matters TV where he has over 500 interviews with celebrities like Jimmy Fallon, Jon Stewart, Kevin Hart, Lisa Lampanelli, Jack Black, Bob Saget, Joel McHale, and about 190 more!